The Statistical and Relational Artificial Intelligence (StarAI) lab is directed by Prof. Guy Van den Broeck. The StarAI lab performs research on Machine Learning (Statistical Relational Learning, Tractable Learning), Knowledge Representation and Reasoning (Graphical Models, Lifted Probabilistic Inference, Knowledge Compilation), Applications of Probabilistic Reasoning and Learning (Probabilistic Programming, Probabilistic Databases), and Artificial Intelligence in general. Aishwarya Sivaraman, Tianyi Zhang, Guy Van den Broeck and Miryung Kim. Active Inductive Logic Programming for Code Search, In The 41st ACM/IEEE International Conference on Software Engineering (ICSE), 2019. Arcchit Jain, Tal Friedman, Ondrej Kuzelka, Guy Van den Broeck and Luc De Raedt. 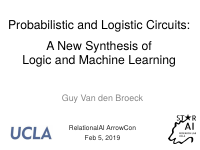 Scalable Rule Learning in Probabilistic Knowledge Bases, In The 1st Conference On Automated Knowledge Base Construction (AKBC), 2019. Tal Friedman and Guy Van den Broeck. On Constrained Open-World Probabilistic Databases, In The 1st Conference On Automated Knowledge Base Construction (AKBC), 2019. Alicia Solow-Niederman, Guy Van den Broeck and YooJung Choi. 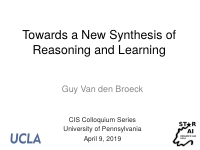 The Institutional Life of Algorithms: Lessons from California's Money Bail Reform Act, In The 8th Annual Conference On Robotics, Law & Policy, 2019. Zehong Hu, Yitao Liang, Jie Zhang, Zhao Li and Yang Liu. 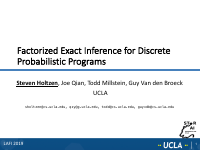 Inference Aided Reinforcement Learning for Incentive Mechanism Design in Crowdsourcing, In Advances in Neural Information Processing Systems 31 (NeurIPS), 2018. Yitao Liang and Guy Van den Broeck. Learning Logistic Circuits, In Proceedings of the UAI 2018 Workshop: Uncertainty in Deep Learning, 2018. Jingyi Xu, Zilu Zhang, Tal Friedman, Yitao Liang and Guy Van den Broeck. A Semantic Loss Function for Deep Learning with Symbolic Knowledge, In Proceedings of the ICML Workshop on Tractable Probabilistic Models (TPM), 2018. Steven Holtzen, Guy Van den Broeck and Todd Millstein. Sound Abstraction and Decomposition of Probabilistic Programs, In Proceedings of the 35th International Conference on Machine Learning (ICML), 2018.